Let’s face it: When compared to Google, Bing doesn’t come close to offering users what they want with search results. 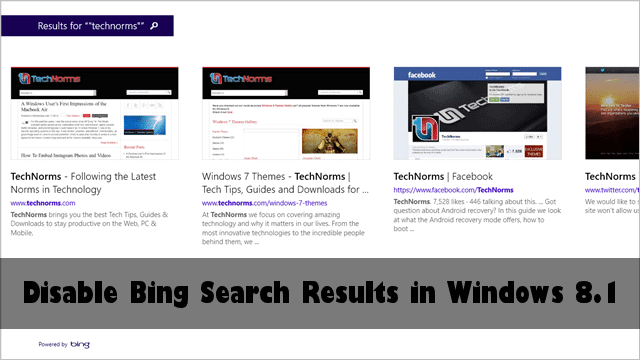 Now that Bing is integrated with Windows 8.1 Smart Search, Windows users may want to get rid of it, and we’ll show you how to get it done. While the fully integrated Smart Search in Windows 8.1 finally brings the search engine of Windows’ user’s dreams to the OS, it also brings trouble. Microsoft has confirmed that Bing ads will be part of Smart Search results which taints what Bing can actually bring to Windows 8.1 users. Also, since whatever you search on Windows 8.1 is transmitted to Bing, this means Microsoft can also see what you’re looking for even in the comfort of your own computer or tablet. If you don’t want that sort of intrusion on your PC, follow these steps to disable Bing search results in Windows 8.1 Smart Search. If you’re ready to eliminate Bing permanently from your Windows 8.1 Smart Search results, open your Charms Bar. You can either click hover over the right side of your screen or use “Windows Key + C” to open the Charms Bar. Then, click on the “Settings” icon. 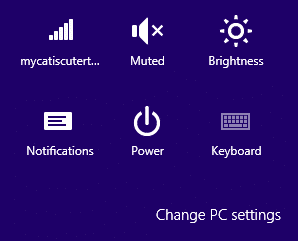 Now, in the bottom right-hand corner of the window, click on “Change PC settings” to open the new Windows 8.1 PC Settings app. Click “Search & apps” in the PC settings left-hand menu. Look for the “Use Bing to search online” option. You’re given two options to work: Turn Bing off entirely or turn Bing off over metered connections. Click the “Slider” under “Get search suggestions and web results from Bing” to disable Bing search results in Windows 8.1. You’ll see that all the options below this will grey out and won’t need to be changed. Since they all relate to using Bing search results, there’s no need to customize them, because they no longer matter in regards to Smart Search. The change takes place immediately, so if you go and search from the Start Screen, you’ll see that Bing search results are no longer included in Windows 8.1 Smart Search. Before you turn your back on Bing entirely, let’s take a look at what it actually does for you in Windows 8.1 Smart Search. 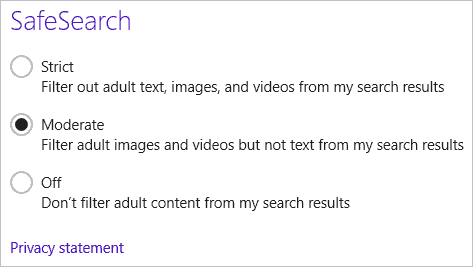 Whether you use Bing or not on Windows 8.1, you can clear your search history at any time by clicking “Clear” under the Search history settings. This clears everything you’ve searched for in Windows 8.1. Your search experience settings let you change how you get personalized results. Personalized search results include using your location and search history to give you more accurate results when you’re looking for something on the Web. For example, let’s say you’re looking for restaurants in your local area. Based on your location, and then other restaurant websites you may have visited, Bing will try to give you better results based on those factors. You can use this type of search, get personalized results without the use of your location and turn this feature off in its entirety. SafeSearch settings let you customize what type of results are included when you search the Web through Bing. Since you’re searching using the Windows 8.1 Smart Search, your results are displayed in the Modern UI of Windows as opposed to a Web browser. SafeSearch lets you set strict or moderate filters or turn it off in its entirety. Depending on what your preferences are, this can be a way to restrict certain Web results from being displayed in Windows 8.1 Smart Search queries. As you can see, you are given some options to work with Bing in Windows 8.1. This still may not be enough to keep it around, so choose wisely. Bing Search has made significant improvements over time, but it pales in comparison to what Google offers most users. While Microsoft may force users to take advantage of Bing, they’ve also given them the option to turn it off. If you want to avoid Bing search results in Windows 8.1 Smart Search, disable it with the above steps. You can always turn it back on later if you desire. Please Note: Windows 8.1 is still a preview for users. Whether you’ve upgraded or installed it, you may run into trouble with your Smart Search results. Let us know of any issues you encounter in the comments below.